The Final Cut is the twelfth studio album by English progressive rock group Pink Floyd. It was released on 21 March 1983 by Harvest Records in the United Kingdom, and several weeks later by Columbia Records in the United States. A concept album, The Final Cut is the last of the band's releases to include founding member and long-time lyricist Roger Waters. It is the only Pink Floyd album on which Waters is credited for the writing and composition of every song. Most of the lyrics are sung by Waters; lead guitarist David Gilmour provides vocals on only one of the album's tracks. 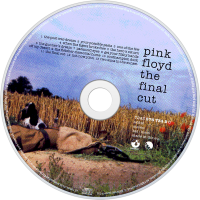 The Final Cut was originally planned as a soundtrack album for the band's 1982 film Pink Floyd-The Wall. With the onset of the Falklands War, Waters changed it to be a critique of war, and also what he considered the betrayal of his father. The Final Cut was recorded in eight studios across Britain, from July to December 1982. As with most of Pink Floyd's discography, a range of session musicians were employed as contributors, but its production was dominated by increasing tensions between Waters and his band mates, particularly Gilmour. Keyboardist Richard Wright was at that point no longer a member of the band. The packaging was designed by Waters, and reflects the war theme of the album. It reached the top of the UK Albums Chart, but received mixed reviews. An accompanying short film was later released. Following the album's release each member of the band concentrated on solo projects, but Waters then announced that he had left the group, and later attempted to keep Gilmour and drummer Nick Mason from using the Pink Floyd name. Gilmour has since expressed his dislike for much of The Final Cut.